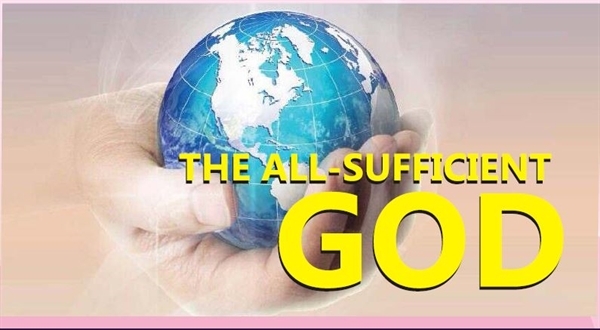 I Am the All sufficient One, says the LORD. There is nothing that I cannot do for you. There is no such thing as impossible in My vocabulary. I create and I heal. I form and I build and make. I Am the all-wise, all-powerful, ever-present GOD that created all things for My purpose and pleasure, and I can certainly control what I have made. I know all things and Am aware of you and your needs. Why put me in a box? Don’t bring Me down to your small thoughts and ways, for they will never be able to satisfy you or bring you the solutions you are looking for. I can and will as you see Me for Who I Am and believe Me for what I CAN and WILL Do for you, says the LORD. It is not what anyone can do or what you are capable of doing, says the LORD. I do all things right and do them well. I never have an oops and never make mistakes. I was not wrong in creating you. I formed you for a purpose that I am fully capable of completing, says the LORD. For I never have an incomplete or a redo. I never miss the mark. It is bulls eye every time! I am on target, on time and perfect. You are My workmanship and even as I said that My Work on the cross was finished for you to redeem you and save you, I will certainly make you a finished work in Me that is perfect and complete, says the LORD. YES LORD YES LORD!!!! GLORY HALLELUJAH!!! THANK YOU JESUS!!!!! I’m ALL IN….Thank you, Jesus! Amen! Might God we serve! Amen! AAAAAAAMMMEENNNN and AAAAAAAMMMEENNNN. WOW WOOOOOOOO HOOOOOOOO THANK YOU HOLY SPIRIT AS I BELIEVE RECEIVE AND CLAIM THIS POWERFUL WORD DECLARATION IN THE MIGHTY NAME OF JESUS HALLELUJAH HALLELUJAH AND ALL GLORY TO GOD ALONE AAAAAAAMMMEENNNN AND AAAAAAAMMMEENNNN!!!!!!!!!!!! !